MR. SIMPSON: Thank you, Mr. Speaker. On February 2nd Transport Canada announced that the Nunavut Fisheries and Marine Training Consortium will establish a marine training facility in Hay River through partnership with the GNWT. Apparently, this is part of a three-year $12.6 million federal investment under the Oceans Protection Plan. Mr. Speaker, I usually know what’s happening in my backyard, but I haven’t received any communication about this initiative. It’s news to me. I just learned about it when the Minister of Infrastructure responded to questions about MTS earlier this week. I don’t know where this facility will be set up, or when it will be operating, or if it’s operating already. Hopefully, ITI or Infrastructure will issue a press release or some sort of information in the near future, because I’m already getting media requests about this, and I really don’t know much about it. On its website, the Nunavut Fisheries and Marine Training Consortium states that it offers a variety of training; deckhand, marine mechanic, bridge officer, fishing masters, et cetera. What types of training will be offered in Hay River, and if the Minister is willing, would he please specify whether or not locals will be engaged in the development of this curriculum? Thank you, Mr. Speaker. MR. SPEAKER: Masi. Minister of Industry, Tourism and Investment. HON. WALLY SCHUMANN: Thank you, Mr. Speaker. As the Member said, I mentioned it yesterday in the House. These are very early days for the marine training centre that the Nunavut Fisheries and Marine Training Consortium has come forward with to locate in our riding in Hay River, which is great news for our constituents in Hay River, and all residents of the Northwest Territories will be able to access a program such as this. Presently right now, there is a needs assessment under way for courses that are appropriate for the required training. As these guys operate out of Nunavut, and now moving to the Northwest Territories, we are going to have to have a look at the situation in the NWT around the fishers and, in particular, the marine transportation services that we run up and down the river. My understanding is already, this spring, though, the courses that are intended to roll out right away are going to help the fishers with a small vehicle vessel operator’s course, which is going to benefit the fishermen. You’ve got to remember that these are Transport Canada certified courses, so this ticket will be good right across the country. Then we will also hopefully get our staff in there from the Marine Transportation Services tugs and barge system to be able to access these programs as well, and get them to benefit from that. I think once that rolls out and they get a little bit of water under their feet, so to speak, the general public will be able to take some of these courses, and they will expand as they seem necessary. Thank you, Mr. Speaker. MR. SIMPSON: The Minister is right. This is good news for Hay River, so I’m surprised there wasn’t a bit of hoopla about it. I want to talk about the cost of training. Since the GNWT employs only a handful of people at MTS and the rest are contracted out, I wonder who will pay for those employed by the contractor. Will it have to come out of the employee’s own pocket? Then, there are the fishermen. Will the training be paid for through the revitalization strategy? There are a lot of questions. Considering all of that, what will the costs of training be, and who will pay for the training? HON. WALLY SCHUMANN: As I said, this is a course that is fully funded by Transport Canada. The costs there will be totally absorbed by Transport Canada. It will be an application-based process, and screening will be made to suitable candidates who will be able to take these courses. Once an applicant is accepted, there will be no costs to the student. MR. SIMPSON: Now, let’s talk jobs. It is what everyone is talking about. How many people will be employed by this institute and, more importantly, how many of those positions will be local in Hay River? HON. WALLY SCHUMANN: As I have said, this is early days with this. You have to remember this is a Transport Canada-funded program through the Nunavut Fisheries and Marine Training Consortium, so we have little knowledge of what is going on because it is not led by us, but my understanding is that it is expected to have up to three instructors starting out presently. That may grow over time as demand is increased. They are willing to hire local people to facilitate this and put on the instructing courses. If we cannot find any people within Hay River or the Northwest Territories to do that, my understanding is that the consortium is willing to train NWT individuals to be able to do this. 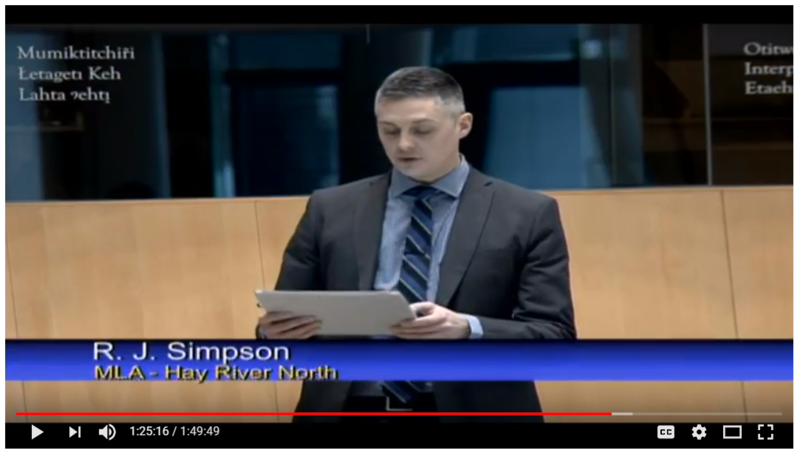 MR. SIMPSON: Thank you, Mr. Speaker. This all sounds great, and, to be honest, I am not even sure who I am talking to right now, if it is the Minister of ITI or the Minister of Infrastructure. I do not know who is the lead on this. I hope they get this information out there for public consumption. My last question is: how many people will be put through this institution? How many people will be trained per year or per season, or whatever the measure may be? Thank you, Mr. Speaker. HON. WALLY SCHUMANN: As I have said, this is early days in this process. They are rolling out with three instructors and, as demand fluctuates up or down, I guess that will depend on the market and the need for this type of training. I would not be surprised, even, if we see people from outside our jurisdiction who possibly want to get into the marine industry come and enroll in this program once they find out it is there. However, as I said, this is early days. We will have to see what it brings. Thank you, Mr. Speaker. Previous Entry:Congratulations to Brendan Green!